REGULAR SHOW best friends Mordecai and Rigby star in their first long-form story REGULAR SHOW: HYDRATION, an all-new original graphic novel from KaBOOM!, an award-winning imprint of BOOM! Studios, and Cartoon Network Enterprises, the licensing and merchandising arm of the network. Cartoon Network veteran writer Rachel Connor (Ed, Edd n Eddy, REGULAR SHOW) teams up with artist Tessa Stone (BRAVEST WARRIORS, Buzz!) for exciting summer shenanigans starring Mordecai, Rigby, Skips, and everyone else from the park in a full-color, 6” x 9” format. The summer is turning into a roast-fest and Mordecai and Rigby are desperate to find a way to cool down. But when a mysterious pool suddenly appears and offers a chance to beat the heat, it’s only a matter of time before these two best buds find themselves in totally water-logged trouble. 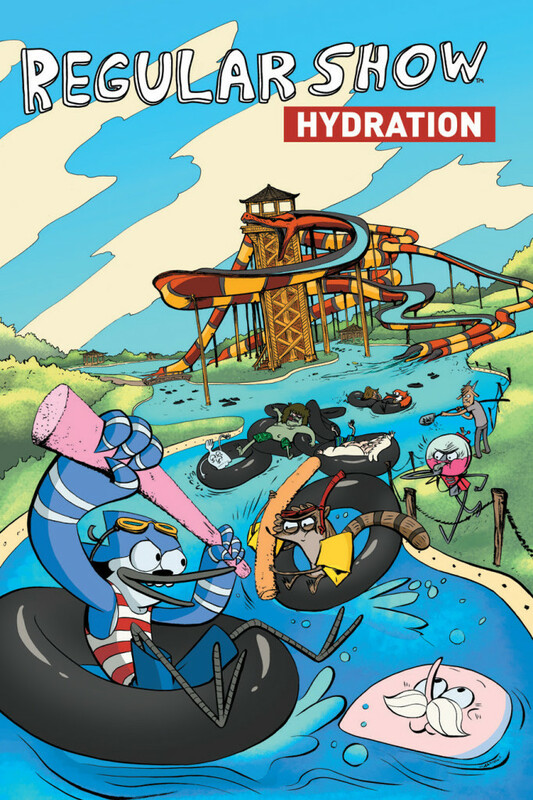 REGULAR SHOW: HYDRATION arrives in comic shops on September 10th with a cover price of $12.99 under Diamond Order Code JUL141002. The graphic novel ships with a cover by REGULAR SHOW ongoing series artist Allison Strejlau. To find your nearest comic retailer, use comicshoplocator.com or findacomicshop.com. It’s also available for order directly from boom-studios.com.